Mental pre-race focus with my TGC-hat signed by Anton Krupicka on. "The Transgrancanaria course had the best first 25k of any race I've ever done (steep, techy goat path) and possibly the worst last 25k (exposed flat road and drainage ditch)." Transgrancanaria 125 (actually it's 128km now with the finish line at the Expo) course can be roughly divided into three marathons. The first one is widely known as the fun part. This 42.8km section offers the most exciting trail running on the island of Gran Canaria. It's easy to register for the full distance and then do complete this 'thriller third' only. I'll show you here how to do it - just follow my five easy steps! The cold winds of March are always blowing from the sea in Agaete. Wear your obligatory rain jacket when you get out of the bus and head for the pier. If you have 90 minutes to the 11pm start like I did, get inside one of the restaurants to stay warm and order a cup of coffee or tea. Walk to the crowded pier 30 minutes before the start. The other runners will protect you from the wind. Take off your jacket and other extra clothes. Drink and eat something. Put on your headlight and red rear light. Start without using the poles. Faro (lighthouse), the landmark a couple km from the new finish line. The uphill to Tamadaba aid station is not as challenging as they say. It's not too steep nor technical. It's 9.8km and can easily be climbed in well under two hours. My time was 1h50min, the cut-off is 3h. I chatted with friends to keep my pace aerobic. Pre-race chilling on Friday night in a restaurant in Agaete with other Finnish runners. At the aid station I took some orange slices and refilled my bottles. I felt excellent and had no issues. So far so good. Going to the Expo (Race HQ) with other Finnish runners. I had studied the race reports from last year. I knew this steep downhill to Tirma would be slippery. The trails in exposed places can be covered with layers of fine sand blown by the winds from Sahara. I had fallen and hurt myself in the beginning of TGC 2012 (on a different course). Therefore my main goal in this race was to avoid falling on this slippery slope. If I just could get down this hill without hurting myself, then I could easily finish withing the 30-hour time limit. The obligatory start-selfie in Agaete 10:50pm on Friday. I ran down carefully and very slowly, but still managed to slide a bit at a curve. Frightened, I slowed down to easy walking pace and focused on not slipping anymore. Suddenly the dusty trail surface with fine sand and gravel started rolling under my Hoka Stinson ATR's. After sliding a couple of meters I fell on my back, felt my arms and legs being scratched, and was soon stopped by a rock that hit hard my left hip. New useful race stuff: T-shirt, buff, visor, bib, wristband. I washed the ubiquitous dirt and blood from my skin in a nearby mountain stream. Then I wiped myself with antiseptic towels and applied about 20 bandaids. Then I checked my hip and it didn't look good. I didn't feel any pain yet but I knew it would come. I thought I was had ran about 14km so it would be less than 5km to Tirma aid station. Presentation of the top runners and race briefing at the Expo Auditorium. There course was more like an adventure race than trail running. There were fun bouldering sections and even a rope-assisted descent down a rock wall. Normally I would have loved this course, but now I was struggling to go forward. Maspalomas dunes are not part of the race course, but worth a visit. Finally I arrived in Tirma AS where I filled my bottles, ate some orange slices and approached the busy medical staff. Unfortunately nobody had time to pay any attention at me. There were bodies of injured runners lying in the ground around me. Instead of waiting for hours, decided to continue right away. I started the second big climb of the night by getting lost. The left turn up was clearly marked, but I ran straight ahead until the other runners called me back. I saw my friend Rudi and we ran more or less together after that. I reached the Altavista Control Point at 27.3km about 5am, 6 hours after start. The full moon illuminated the landscape and there were some really cool photo opportunities, but I didn't want to waste any more time. Examining the longest TGC course ever: 128km. Artenara (33.4km, 6:08am, 7:06 hours after start) was a nice mountain village with a slightly better aid station. I arrived I drank two big cups of black coffee at once from my half-liter Sea To Summit X-Mug. I also tried the green mystery soup, but it made my stomach turn and I launched an immediate search operation for the nearest toilet. As the day broke I expected to get better. On the contrary, I felt worse by the minute. The strong wind was troubling as there were heavy dusty/sandy gusts. My throat felt swollen and infected. I found speaking, eating and even breathing increasingly difficult. The flu virus that attacked me the week before the race seemed to come back now with a vengeance. My bad hip made me limp. I came here to run the whole distance, but now even walking was challenging. At this pace, I wouldn't be able to finish in 30 hours. I started to contemplate the inevitable drop out. This is the beach running section of the course at Maspalomas Faro. When I arrived in Fontanales the starting place of Advanced 83km (42.8km, 8:14am, 9:14 hours after start), I told the young lady in charge of the time control that I would like to stop my race here. She is super tough, and won't let whiners like me quit for nothing. She asked me if I'm sure and suggested I wait half an hour before the final decision. We agreed on that. There wasn't any medical care available, so I used the time to add a few bandaids. Also Rudi was there at the same time, and also he contemplated a DNF as his energy levels were low. Superhero Rudi leaving Fontanales - he finished TGC about 20 hours later! After half an hour I got my DNF officially registered online. However Rudi said he will try to get to the next aid station in Teror, as "sometimes it turns around". He was right, as he would finish the race on Sunday morning. Quite a turnaround - or more probably, this dude is simply extremely tough! I was amazed to see him check his blood sugar with a pin from his bib, as he had forgotten the proper needle at the hotel. There was also a Brit who fell in the same downhill as me and also dropped out in Fontanales. A Slovenian and a French guy also decided to DNF there. Getting transportation for us proved to be challenging for the organizers. Finally a taxi van dumped us to Garanon, the 82km aid station and the starting place of Maraton 44km. I enjoyed a good warm meal twice there, as I was pretty hungry. It was much colder here at 1600m altitude, and I wanted down to a warmer climate soon. 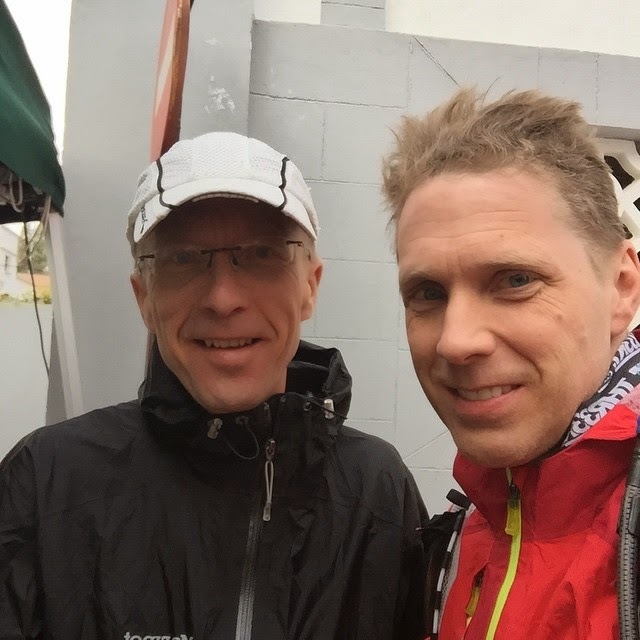 Two Finnish finishers: Timo (Advanced 83km) and Pekka (TGC 128km). We went to the roadside with the French guy and managed to hitch-hike to Tunte, 95km and the starting town of Starter 32km with some local dudes. From there we got another lift with a nice French couple to Arteara, 109km and starting place of Promo 17km. We watched runners pass by for a long time until their French friend passed by. Then they drove me to Maspalomas. I guess my new motto from now on will be: 'French will be friends'. It was already evening. I had something to eat, took a shower, fixed my wounds once again and walked to the finish line by the Expo. I saw a few friends finish, but got exhausted after a couple hours and crawled back to my apartment to sleep around 3am. I don't feel like whining at all. Actually I feel relatively lucky. Many runners suffered a fate so much worse than me. I didn't break anything, except my confidence and my Lifeproof Nüüd iPhone cover. For instance, Swedish top runner Johan Lantz broke his femur during the race. Hopefully he will recover well and be able to come back for the win next year - which he deserves judging by his Instagram feed. It was sunny, but the sandy wind from Sahara subdued the heat. Lithuanian Gediminas Grinius (14:23:27, new course record) and Catalan Nuria Picas (16:53:27) won the race. Many top runners like the local hero Yeray Durán, Iker Karrera, Pau Bartolo, Joe Grant, Fernanda Maciel, and Nikki Kimball had to drop out. It sure was a BRRRRUTAL day in the office for everyone. The view from my cheap apartment to La Charca Nature Reserve across the lagoon. As always, I'd like to take this opportunity to extend my gratitude to the organizers, volunteers, participants, friends and sponsors of this awesome event! Transgrancanaria has improved so much since I participated three years ago. There is still some room for improvent in the minor details like the variety of the aid station food, but I'm sure it will all be so much better next year. Green oasis in the desert: the island is generally very dry. Naturally I have to come back to Transgrancanaria 2016 because I have this unfortunate unfinished business there. I can also honestly say that I'm very fond of the Canary Islands, and I'm always pleased to have an excuse for a revisit. A fellow sandstormtrooper hiking in the desert. Here's my bonus video shot at Maspalomas dunes on a windy day. See you at TRRRRANS GRRRRAN CANARRRRIA next year! VENGA VAMOS ANIMO! TP, great write-up of a difficult and I believe painful experience. I can hardly fathom how you continued for such a long time after getting injured – that just proves: you are a tough as nails badass!!! TransGC is packed with white-knuckled twists like a fast-paced thriller - can't wait to race with you in 2016! Challenge your limits, don't limit your challenges! You Are Doing Something Wrong - So Keep Going!